MBCx can provide new opportunities for commissioning providers. In today’s complex buildings, even small problems can have big impacts on building performance. Lighting, heating, ventilating and air conditioning systems need continuous performance tracking to ensure optimal energy efficiency. Yet, a formal process for data gathering and analysis is not commonplace in the nation’s building stock. Plus, there’s often a disconnect between the energy modeling done in isolated, one-time re-commissioning or energy audit projects, and what really happens in day-to-day building operations. What’s needed is a systematic approach to tracking energy utilization that helps detect problems early, before they lead to tenant comfort complaints, high energy costs, or unexpected equipment failure. That’s why new robust energy monitoring technologies and Monitoring-based Commissioning (MBCx) techniques are now at the forefront in building energy management. MBCx has the potential to keep buildings running at peak efficiency by addressing the “performance drift” which occurs when building systems fall out of calibration or fail altogether. A sensor network gathers discrete data measurements and with analysis capabilities identifies trends, detects leaks and alerts building engineers to hidden problems that waste energy. Savings from persistence and optimization of savings from RCx thanks to early identification of deficiencies through metering and trending. Several studies have shown that RCx savings can degrade without an explicit effort to monitor and maintain them. 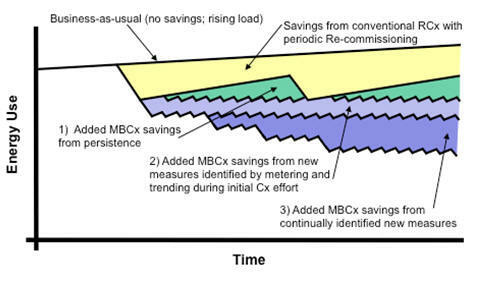 Savings from measures identified through metering and trending during the initial commissioning effort (measures unlikely to be found from RCx alone). Examples of such measures include: poor control of chilled water distribution to air handlers; unnecessary chiller operation due to disabled chiller lockout; poor VAV zone control due to inoperative actuators on air dampers and hot water valves. Continually identified new measures. By virtue of the continuous nature of the monitoring, MBCx can identify new problems that emerge after the initial retro-commissioning investigation stage, such as equipment cycling and excessive simultaneous heating and cooling. 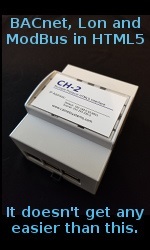 Monitoring-based Commissioning (MBCx) uses retro-commissioning techniques, but also features installation of extensive, persistent monitoring for on-going diagnostics. This preserves long-term savings potential, and at the same time, improves system reliability and comfort as building conditions change. Evaluate new renewable sources to ensure they are performing as expected. These are just a few examples of how MBCx can provide the data and insight required to discern energy savings opportunities and optimize building operations. But that’s not where it stops. Enhanced data collection is just the first step – it’s how the measurements are exploited on a perpetual basis that yields lasting energy efficiency gains. A new generation of building energy management (BEM) systems - like Agilewaves Building Optimization System™ - provide the performance measurement foundation to actively monitor electric, gas and water usage in real time. Facility owners can easily display critical building information, track performance, manage and control resource consumption to trim costs. Agilewaves provides a robust foundation for MBCx since we provide the rigorous and on-going metrics for continuous performance improvements. Once an accurate baseline is set, then deviations highlight opportunities for operational improvements or equipment repairs. Peak demand mitigation, in particular, can generate immediate savings. By supplying the time-of-day statistics for each building area or subsystem, these BEM systems provide guidance on energy usage, match it to utility pricing schemes, and generate alarms to help mitigate peak demand charges. Molding the raw data into client-specific performance reports is the ultimate goal. These new technologies allow providers to custom design “smart alarms” to flag problems, training staff to recognize what the alarm conditions signify and react, energy efficiency gains can be maintained over the long haul. Plus, training deliverables can take on a whole new dimension, going beyond traditional O&M manuals for building staff, to fine-tune systems and optimize building performance. Agilewaves recently announced a program that allows commissioning experts to offer a new value-add Sentinel Service by remotely monitoring client sites to keep uncovering low-cost or no-cost energy savings opportunities for clients. Our commissioning partners see it as a way to deliver “persistent savings via persistent monitoring”, and hence, to enhance and extend client relationships. With improved insight into a client’s on-going operations, commissioning providers can recommend set point adjustments, design new alarms, and make sure energy savings last over the long haul. The bottom line? MBCx technology and techniques can ensure that energy efficiency gains do not degrade over time – a win for clients – and for your client relationship. 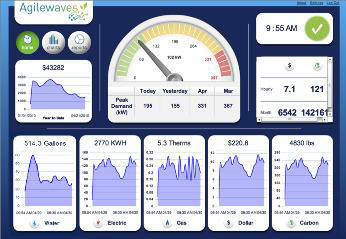 Peter Sharer is founder of Agilewaves, an energy management system firm based in Menlo Park, CA. The firm’s Building Optimization System™ provides facility managers with the real-time, rigorous metrics needed to increase energy efficiency, reduce energy costs and meet the persistent monitoring requirements for green retrofits, monitoring-based commissioning (MBCx), Energy Star, LEED, and Net-Zero Energy Building projects. Peter can be reached at pshraer@agilewaves.com.